The European Space Agency (ESA) has destroyed its last supply ship to the International Space Station (ISS), finishing its missions to the orbit. The Georges Lemaitre burned up in a suicide plunge into the Earth’s atmosphere. The Georges Lemaitre was launched six months ago by an Ariene 5 rocket from ESA’s base in Kourou, French Guiana. It separated from the ISS on Saturday and the end of the seven-year mission was greeted with emotional scenes at the control center in Toulouse, southwest France. Engineers had hoped to bring it down to the earth’s atmosphere in a long, shallow trajectory to help to plan for the ISS’s own destruction, scheduled for around 2024. This had been set for February 27 but was scrapped when a fault was found on one of the spacecraft’s four power sources. Sunday saw the suicidal plunge with the truck burning in the atmosphere on reentry. The European spacecraft were designed as robotic delivery vehicles and the so-called Automated Transfer Vehicles (ATVs) acted a test bed for innovative technology. During their missions to the ISS, they were used for storage and habitation and their onboard thrusters were also used to boost the ISS into a higher orbit. The 20-ton spacecraft ferried a total of 32 tons of supplies to the ISS, which counts for ESA’s agreed share of 8 percent of its running costs. During their mission, the units were also used for living space, and were filled with human waste and rubbish which to be burned during reentry. The ATV was considered to be a success and its cylindrical design will be adapted for the service module of NASA’s new Orion spacecraft, the successor to the shuttle. "It is with a feeling of pride that we look back at our accomplishments on the ATV program," said Thomas Reiter, Director of Human Spaceflight and Operations. 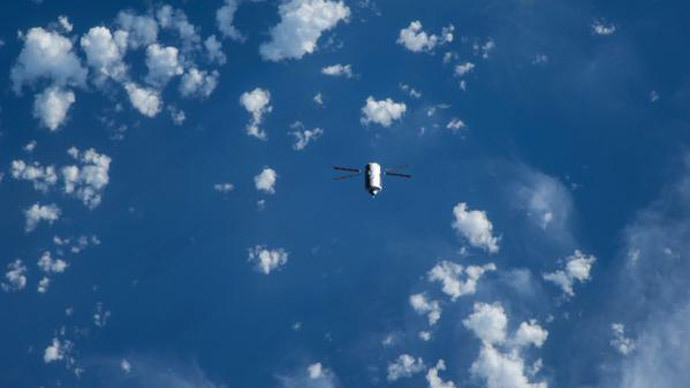 Now the ATV program has drawn to a close, ISS supply missions are in the hands of Russia’s progress freighters and Soyuz manned spacecraft, Japan’s HII Transfer Vehicle (HTV) and the craft built by two US private companies for NASA SpaceX and Orbital Sciences, although Orbital suffered a major rocket failure in October and has ended its supply missions until further notice. All five of the ATV spacecraft were named after famous Europeans in space exploration. The first was called Jules Verne after the 19th century French science fiction writer. The following three were called for Eduardo Amaldi, Albert Einstein and Georges Lemaitre, the father of the Big Bang theory.